Book Reviews for books that are age appropriate for middle graders (4th-6th grade). I have the K-1 Summer Fit book and I’m very impressed. You may not know it, but I have my degree in elementary education, so I was very interested in these books. Last summer I drove my kids crazy because every day they had 20 minutes of reading and 20 minutes of homework. I spent a lot of time on the Internet searching for the correct math problems and reading activities for my kids to do. They learned a lot and did great, but it took a lot of effort on my part. This book makes it easy! All I have to do is buy a book (I haven’t seen the older books so I’m hoping I won’t have to supplement.). This is a great idea. Why didn’t I think of it??? The summer is broken down into weeks and then days. There is a page for each day of summer (I haven’t counted, but it’s got to be really close.). On this page there are some brain activities like math problems or reading activities. There are also some physical activities. The kids not only have to exercise their brains but their bodies as well. There are cardio and strength exercises that switch off. There are lots of ideas and there are more online as well. Then each week there is a value. The first one in this book is Honesty. There is a picture of Abraham Lincoln and it discusses his nickname “Honest Abe.” It talks about how honesty is important and why. I hope the values are the same in each book so it will be easier to discuss with my kids all at once, but I’m not sure. For each week there is a certificate to complete when the child finishes the weekly activities and there is an incentive. The incentive could be whatever you want. It could be a treat, but it could also be a trip to a local museum or a picnic at the park, or a family game of kickball in the backyard. I love this! There are also a lot of activities, games, and more challenging work pages online. As a teacher I would definitely recommend these books to parents, and as a parent I am so glad that I don’t have to do all the work this summer! I love that it is not just for the brain, but for the body as well, and I love that it allows me to have fun with the kids while they are learning. I have the K-1 book but now I need the 2-3 and the 3-4 books as well! I really enjoyed this book. It is a little “Eragon,” a little “Lord of the Rings,” and a little “Harry Potter” all rolled into one. It has everything you want: love, war, wizards, magic, magical creatures, good vs. evil, mystery, and suspense. It is “clean” and very creative. Ms. Arnold has a fun imagination. At first it really reminded me of the story of “Eragon.” A boy, who doesn’t know who he is, needs to be schooled and mentored, and so is hidden away while he learns. As the story progresses it takes on a “Lord of the Rings” feeling with wizards and evil wizard creatures. Although it may have some of the elements of these books, it is very different and stands alone in its storyline. There are some twists and turns that surprised me, which made it a fun read. I felt like I really knew the characters and thought Ms. Arnold did a very good job with their development. I wish we had gotten to know a little bit more about Granna Fela and Mr. Otherton, and how he fit into the kingdom. Did he live in the Hidden Kingdom? And which time period did Granna Fela come from? I also wish we had gotten to know Etcheon’s parents a little more. Some of the time travel was a little confusing, especially with Etcheon’s time frame. It took me a little while to realize how long he had been gone from his kingdom was much different than his age would suggest. Overall I really enjoyed this book. It was a fun and easy read. 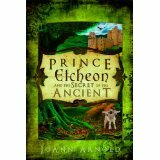 I would recommend it if you are in the mood for a good fantasy story. Recommendation: 9 and up. I am going to hand it over to my 9 yr-old after school. I know that he is ready, though, because he just finished the last “Harry Potter” and has also read all of “Fablehaven.” If a child hasn’t read those you may want to read it first. It fits in the same category as those books do. It is fine for some but may be too much for others. As always, I suggest parents read it first just to make sure it is a good match for your child. Thank you Ms. Arnold for saving me, I didn’t know what to suggest to my son to read next! Wow! Do I love this book!!! I have read it before, and I will definitely read it again! My first experience with it was when my Dad read it to my siblings and me. I was hooked from the beginning. We actually read it right before the movie came out, so it was exciting to be able to watch the movie after reading it. I loved it, and as soon as I could read well enough, I read it on my own. It is a great read-aloud, for boys and girls. It has it all–action, romance, suspence, love, sword fighting, drama, ROUS’s, death, miracles, and one of the most beautiful girls in the world. Who could ask for more? I love the humor, the characters, the plot, and I think I have almost the whole thing memorized. Classic. That’s all I can say, classic! I recommend this book for about age 10 and up. I also recommend reading it out-loud for your child’s first time. Don’t worry, you don’t have to read the kissing parts! Recommendation: Fourth Grade and Up. In the book the author says he read it to his son at 10. Great as a read-a-loud or a read-to-self book.